The University of Mississippi School of Pharmacy is launching the Faser Capital Initiative to support renovations in one of its main buildings on the Oxford campus. Faser Hall is currently home to faculty offices, laboratories and a skills laboratory. Today, the first and second floors of the building remain much as they appeared when first constructed in 1969. On a recent site visit from the Accreditation Council for Pharmacy Education, the first and second floors of Faser were described as being in “desperate need” of an upgrade. Though the school was fully reaccredited, it is time to address this substandard building space. The Faser Capital Initiative will support the renovation of Faser Hall and improve the academic environment for current and future pharmacy students, as well as our research facilities. To keep pace with the rapidly changing demands within the pharmacy profession, the School of Pharmacy constantly monitors and addresses technological capabilities within the classrooms and lab space. Additionally, the size of our facilities literally dictates the number of students we can accept, therefore, affecting the size of our professional program. Through renovations, new construction, technological upgrades and lab improvements we strive to provide the best learning environment for our students. Naming opportunities are a wonderful way to publicly show your support or recognize a loved one and are available through a large range of sponsorship levels. Additionally, in kind donations of software or equipment are welcome for consideration. Dedicated professors define the School of Pharmacy’s academic reputation. The influence our faculty wields is indisputable and invaluable. They not only share their vast knowledge with students, they fuel a love of learning, expand knowledge and provide compassionate patient care. An investment in faculty is an investment in our students and subsequently our academic reputation. Only by recruiting and retaining top faculty are we able to recruit and retain the brightest students. We ask you to consider a gift to support our talented and deserving faculty. 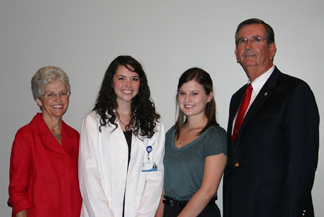 Sarah (left) and Jim Ainsworth of Hernando meet the first recipients of the scholarship they created in their names: Laura Luther of Hattiesburg (second from left) and Katie Sims of Athens, Ala.
An investment in today’s student will yield great returns for the pharmacy profession and the health of our communities. Nearly 80% of 2010 graduates utilized a federal loan at some point during their academic career, and the average total debt for the 2010 graduating class was $47,417. Click here for an estimated cost of attendance. Competitive scholarship support attracts promising students and diminishes the financial constraints many students face. Scholarships can be need-based, merit-based, or a combination of both. Donors help to establish the criteria for their fund. 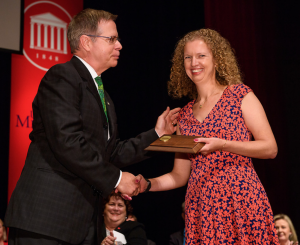 Endowed scholarship funds are named and provide recognition in perpetuity for the donor or a designated honoree. The School of Pharmacy has a critical need for graduate student support or fellowships. Ole Miss lags behind sister institutions in its ability to provide ample graduate support. Yet these higher cost students are essential to the schools ability to maintain its reputation as a cutting edge research institution. Annual gifts of any amount may be directed to the general faculty support fund or designated to a specific unit or department. For more information on how you can support your School of Pharmacy, please contact Port Kaigler, School of Pharmacy Director of Development, at port@olemiss.edu or (662) 915-5944.